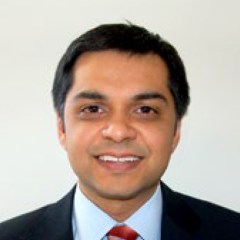 As Vice President and Chief Medical Officer, Specialty Pharmacy at CVS Health, Surya Singh is responsible for the company’s specialty pharmacy client strategy, analytics, clinical programs and innovation. In this role, he leads a multifunctional team of clinicians and analysts, manages the company’s external partnerships in relevant areas, and participates in a variety of strategic initiatives. Singh is licensed and board certified in internal medicine. He continues to care for patients as a Hospitalist at the Brigham and Women’s Hospital and is an Adjunct Instructor of Medicine at Harvard Medical School.